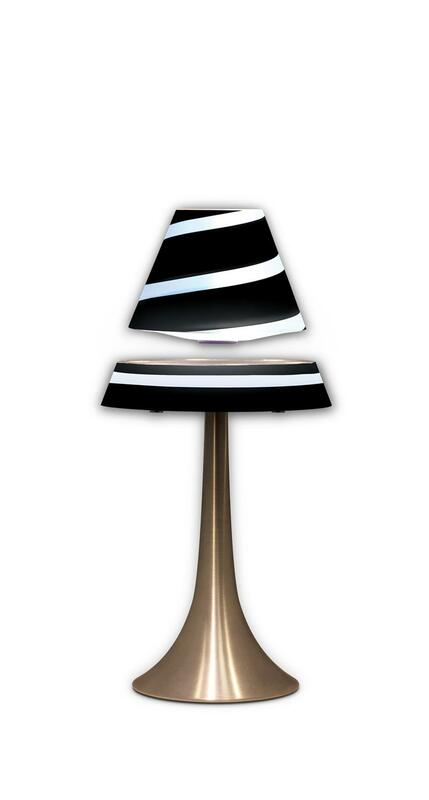 The levitating lamp (see video below) incorporates cutting edge technology with chic style to provide you with the most revolutionary home accent you'll see this year. This beautiful floating lamp provides accent lighting while amazing all who see it with its apparent disregard for gravity! Soft white light shines up into the levitating lamp shade by way of six white high density LEDs. The lamp shade hovers an amazing three centimeters off of the lamp itself. The powerful ring of LED lights shine upwards into the lamp shade and reflect off of mirrors to provide cool white accent lighting. The LEDs have a light intensity of 300 lux and only use 15 watts of energy. The levitron lamp utilizes a cloth covered 6.5 foot power cord to ensure that the lamp may be ideally set-up in any room of the house. The 'antigravity' force that repels the shade from the base is magnetism. 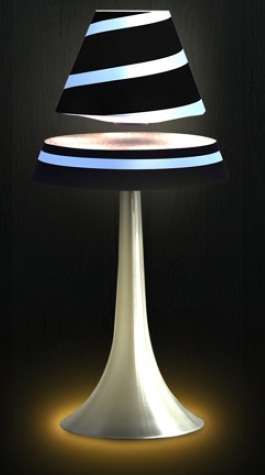 Both the Levitron lamp levitating shade and the base are magnetized, but oppositely. The principle is that two similar poles repel and that two opposite poles attract, with forces that are stronger when the poles are closer. There are four magnetic forces on the floating shade: on its north pole, repulsion from the base's north and attraction from the base's south, and on its south pole, attraction from the base's north and repulsion from the base's south. Because of the way the forces depend on distance, the north-north repulsion dominates, and the levitating shade is magnetically repelled. It hangs where this upward repulsion balances the downward force of gravity, that is, at the point of equilibrium where the total force is zero. 16.5" height, bottom of shade 7.5", bottom of stand 5.75"